We are living in an increasingly complex and non-predictable world where change is not the exception but the new norm. With change comes a higher degree of uncertainty and volatility. As the multitude of global challenges and rapid technological transformations in the age of the fourth industrial revolution risk creating a situation where we “no longer see the wood for the trees”, the need for a future-fit development co-operation is more vital than ever before. How can we reform de-development cooperation in the 21st century to ensure it can harness the opportunities of the on-going transformative changes and mitigate potential negative impacts to deliver on Agenda 2030 with the imperative of leaving no one behind? It’s this question that lies at the heart of the recently published OECD 2018 Development Co-operation Report “Joining Forces to Leave no one Behind”. Chapter 12 of the report presents part of the answer: By using strategic foresight to inform future development planning, and designing policies that are agile and future “robust”. What is strategic foresight, and how can it be leveraged as an accelerator to achieving the global goals? Strategic foresight is an organised, systematic process for engaging with uncertainty and looking beyond the expected. By thinking systematically about the future, strategic foresight helps improve the future-readiness of development co-operation. Or as Angel Gurria, the OECD Secretary General, puts it: “Strategic foresight means better policies … [it] is one way to inform good decisions. It is about questioning what we expect, and testing whether our hopes are realistic. It is about reaching beyond forecasting into exploring the unexpected”. Strategic foresight helps break down uncertainties, explore and prepare for alternative futures. By adopting a “what if?” approach to specific situations, foresight has the merit of identifying weak signals of change and emerging trends, and expanding the range of plausible alternative futures beyond the most expected ones. Strategic foresight hence allows decision makers to prepare better by designing strategies and policies that are future-informed and robust in the face of changes. Strategic foresight helps communities, organisations and leaders develop a common, shared vision and purpose of the future they desire. Understanding alternative futures allows leaders and communities to understand how these may emerge, what is desirable and undesirable, and how to move towards their desired future through jointly agreed change strategies. Strategic foresight can help transform development policy making towards an agile and outward-facing approach that reflects today’s volatile, interdependent and uncertain world. By doing so, it can help build organisational culture to seek out, consider and prepare for the unexpected, as part of a future-informed strategic planning approach, leading to the development and strengthening of “future literacy” over time. Strategic foresight can hence help improve the quality of future development planning, not only from a top-down, but also bottom up perspective. It is a way to give voice to the “voiceless” and promote participation in future development planning of those often left behind. It can help shape policy processes in a way so that they become more democratic, inclusive and participatory. By seeking out “pockets of the future”, which frequently lie on the periphery, applying strategic foresight to the SDGs can bring those who are failing to participate in the benefits of development. When all members of a community are able to collaboratively discuss and imagine their futures, the results can be deeply empowering for those on the margins. Emerging new practice has demonstrated the positive impact of strategic foresight. Across OECD countries, emerging economies, multi-lateral and multi-stakeholder development systems and organisations, growing interesting in strategic foresight manifest itself in forward-looking national development planning exercises and donor outreach. 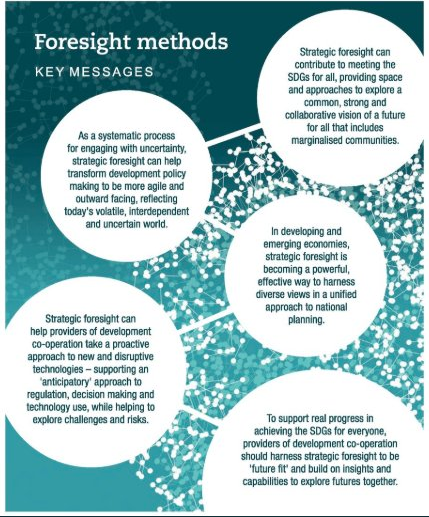 Use strategic foresight to help transform development co-operation so it is future fit – in programmatic design, but also in going beyond traditional citizen engagement, and exploring frontier issues. Build on insights and capabilities to jointly explore futures including around emerging issues and practices. Examples include topics such as prevention, “lean and agile foresight approaches, build future-generation governance and policy-making processes and institutions. These ideas will be explored in more depth – immediate next steps include collective scanning at the OECD and piloting a capability-building programme that is peer-led among a cohort of early innovator countries who can continue to lead the way. Strategic foresight, however, it is not a silver bullet, another development approach or a “solution” – it’s rather a profound belief in the importance of a culture that can engage with systemic change and disruptions over time. If applied appropriately and systematically, foresight can do many things right in planning and taking action for a future we want. Especially where a proactive approach to innovation is needed, strategic foresight can help harness the potential of future trends and mitigate its negative impacts. Foresight is hence central to the act of development itself, and critical if the world is to meet the SDGs. It is not a luxury; it is a necessity.